April 10, 2019, Midland, Mich. – The Midland Artists Guild (MAG) held their 35th annual juried exhibition April 8 at Creative 360. 37 artists entered the show, and 77 pieces of their pieces now grace the Creative 360 gallery. The show includes painting, sculpture, photo, fiber, and mixed media pieces. Philip Hanson, Lecturer of Art at SVSU, served as jurist and announced the winners during the opening reception. 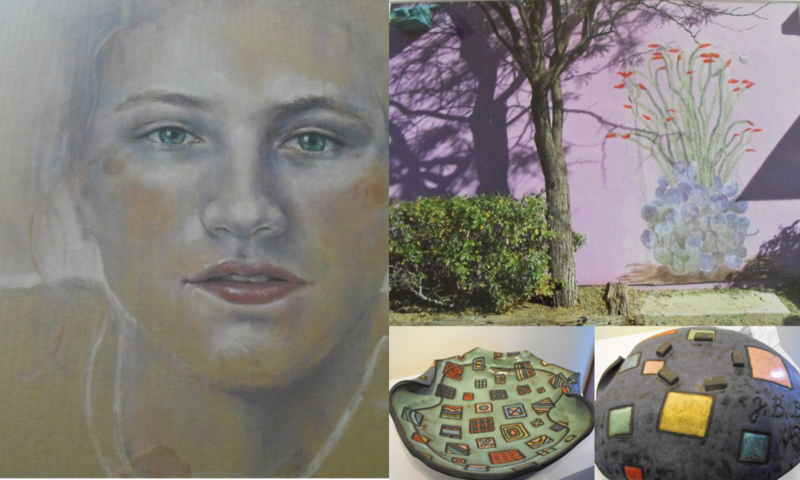 Congratulations to Jody McDonald Rider who won Best of Show and the Member’s Choice Award for her pastel, Behold (left); Carol Buller who received 1st place for her photography, Cactus (Tuscon, AZ) (top); and to second place winner Jazminka Blazina for her stoneware piece, Triangle (bottom). Three pieces received the Award of Excellence: Leonardo’s Rock by Margaret Colaselli (left); In Deed Roses by Heather Deogracia (middle); and Autumn Unfolding by Jan Weber (right). Three artists received Awards of Merit: Storm Coming by Pat Smith (left); Harden Lake by Jean Matheen (middle); and Building a Mystery by Carol Nutter (right). The show will be on exhibit through May 12. Visitors can submit their vote for the People’s Choice Award that will be announced at the end of the exhibit. MAG would like to thank the sponsors who make the exhibit and prizes possible: Ace Hardware, Cafe’ American, Creative 360, Eastman Party Store, Espresso Milano, Grand Traverse Pie Company, Midland Center for the Arts, Midland Community Center, Midori Sushi & Martini Bar, Shirlene’s Cuisine, Stacker’s Grill. Founded in 1981, the Midland Artists Guild is an active and dynamic organization of more than 100 members from the Great Lakes Bay Region. Membership in the Guild is open ot anyone who participates or has an interest in the visual arts. MAG members have diverse backgrounds, as well as broad levels of experience working in a range of media. Whether you are a beginner or professional, we encourage you to join us in exploring the art world through events and activities offered by the Midland Artists Guild. Find more information on their website at www.midlandartistsguild.com.